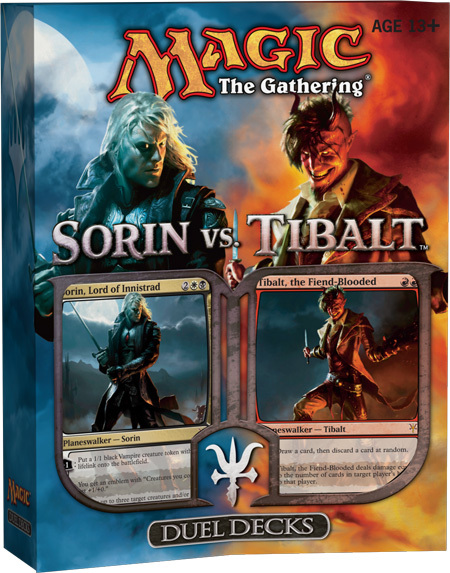 Sorin vs. Tibalt appears to be a pretty awesome duel deck. It will be released this Friday, so check out your local gaming store, or your local Walmart or Target (since they'll probably get them as well if they have a card section near the registers). Tibalt's deck has two Akoum Refuge from Zendikar and two Rakdos Carnarium from Dissension. Both of these come in handy for a Red/Black deck, a Jund deck, a Grixis deck, or a five color deck (Kaleidoscope). Sorin's deck has two Tainted Field which was originally printed in Torment. The "Tainted" lands was a land cycle of dual lands that each had black as a color (so Tainted Fields, Tainted Isle, Tainted Peak, and Tainted Wood are the four in the cycle, along with Cabal Coffers which gives you a black mana for each swamp you have, so it isn't a double swamp land). Of course, I have an original Tainted Isle from a booster I bought at Walmart, and then I have the one from Planechase 2012. Anyway, Tainted Field will be good for Esper decks, White/Black decks (maybe an Obzedat deck?) or a Kaleidoscope deck. So it can be useful for something I'm working on. In Tibalt's deck, I really like Blazing Salvo and Browbeat. With Blazing Salvo, it deals three damage to a creature or else the controller of the creature takes five damage to keep the creature. This is a pretty tough move if the creature is really important to your plans like Twilight Drover in Sorin's deck. Browbeat (which gets new art) deals five damage to an opponent if they choose to, or else target player draws three cards. So either let your opponent have three cards for more burn spells, or take five damage. Tought choice, but these are awesome because of what they do to your opponents. With Sorin's deck, aside from the Lingering Souls (which is the same art as the promo from a couple months ago), I'm only interested by the prospects of Death Grasp and Zealous Persecution. Death Grasp deals X damage to a creature and you gain that much life where all you have to do is pay X mana plus one white and one black. It's lifelink but without a creature that you control getting themselves killed. Zealous Persecution is pretty awesome since for just one white and one black mana, all of your creatures get +1/+1 until end of turn and all of your opponent's creatures get -1/-1 until end of turn. This definitely helps all the flying spirits you probably have when you play this. So aside from those cards, the only other thing I'm really looking forward to Sorin vs. Tibalt are the foil, alternate art planeswalkers. Tibalt may not be the best, but with this deck, he has some interesting prospects. Sorin has always been pretty awesome.